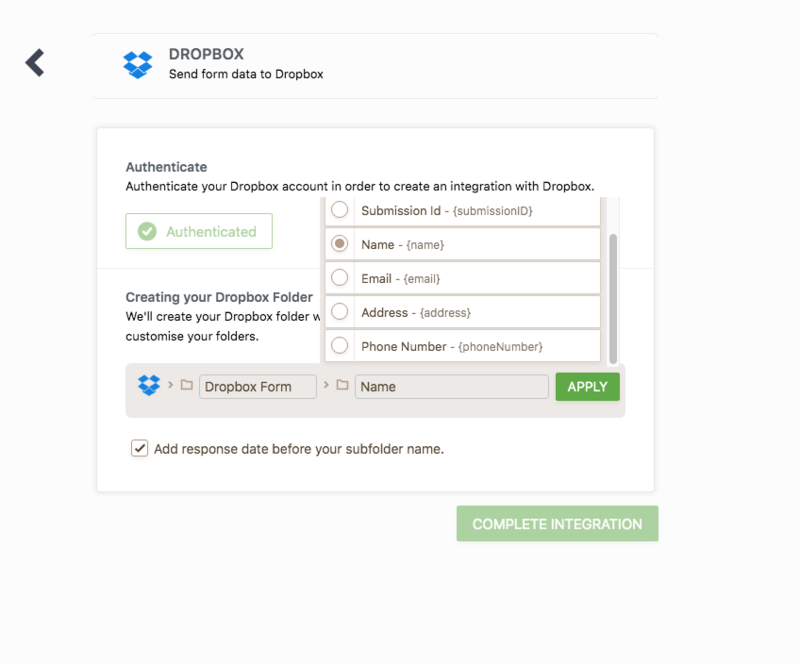 Dropbox File Request: How can someone upload to my Dropbox? With Dropbox file requests, you can collect files from someone. 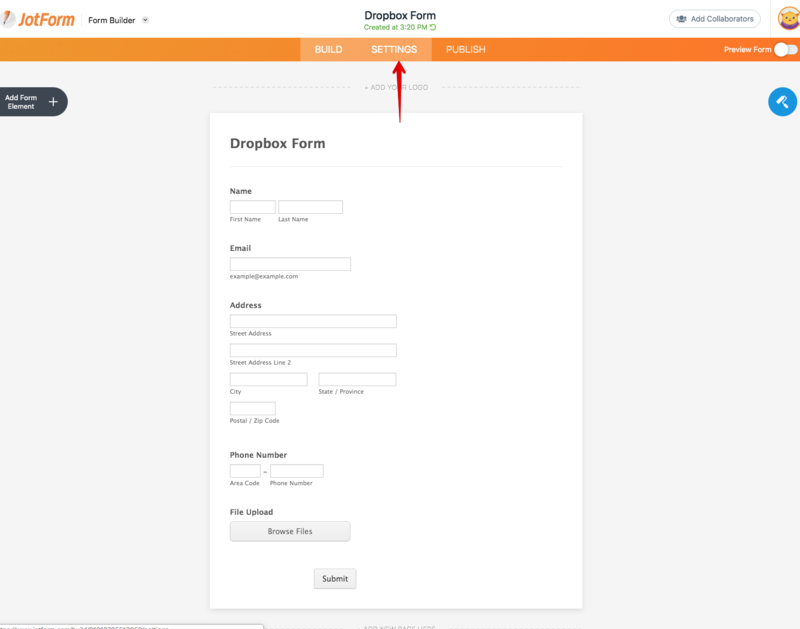 You can also get directly these files by integrating a Jotform form with Dropbox. 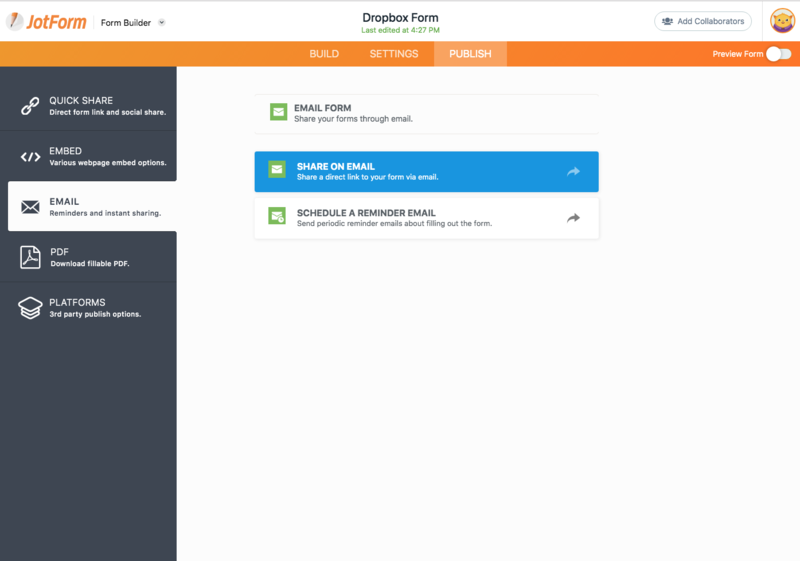 Let's look on how to create Dropbox Forms in 3 easy steps. 1. 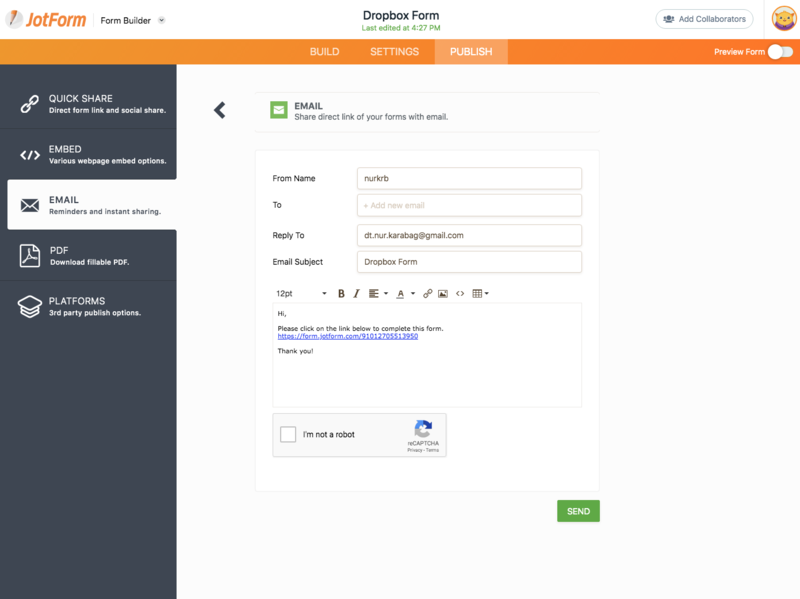 Open JotForm My Forms Page and click on the Create Form button. 2. 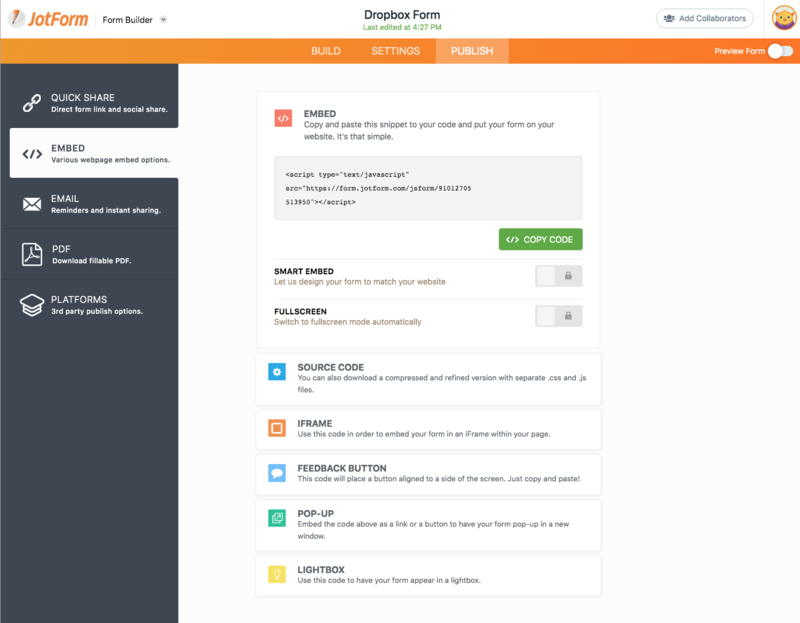 Choose a form layout. 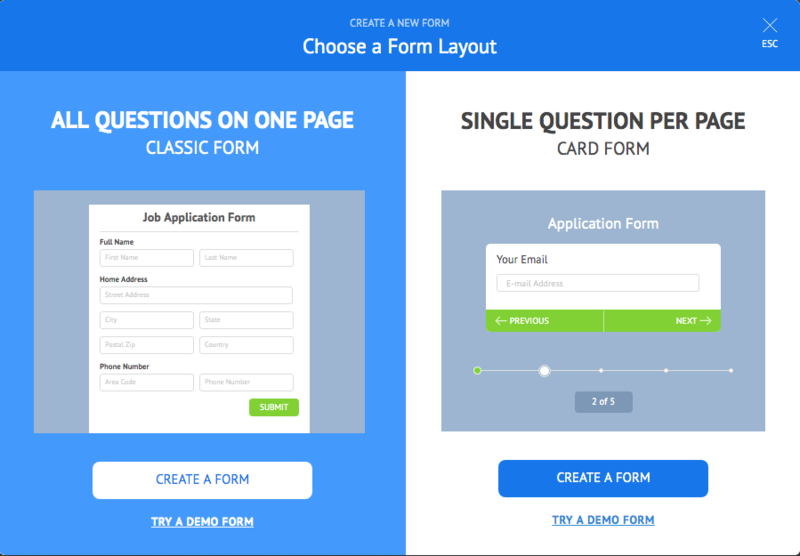 You can create a classic form or a card form. 3. Choose a form according to your needs. 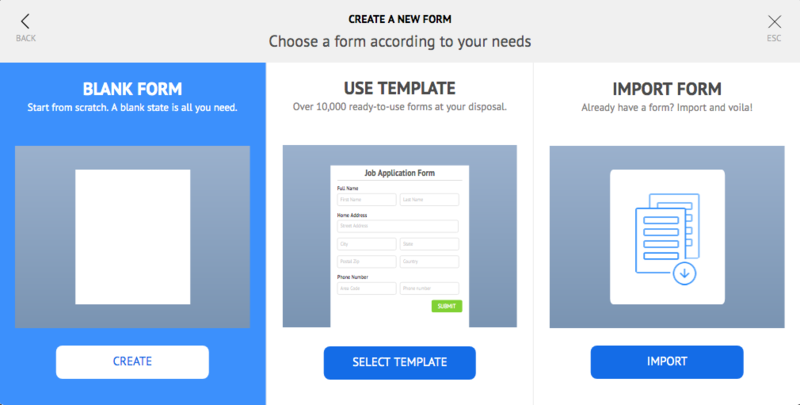 You can create a blank form, use a template or import your existing form. 4. 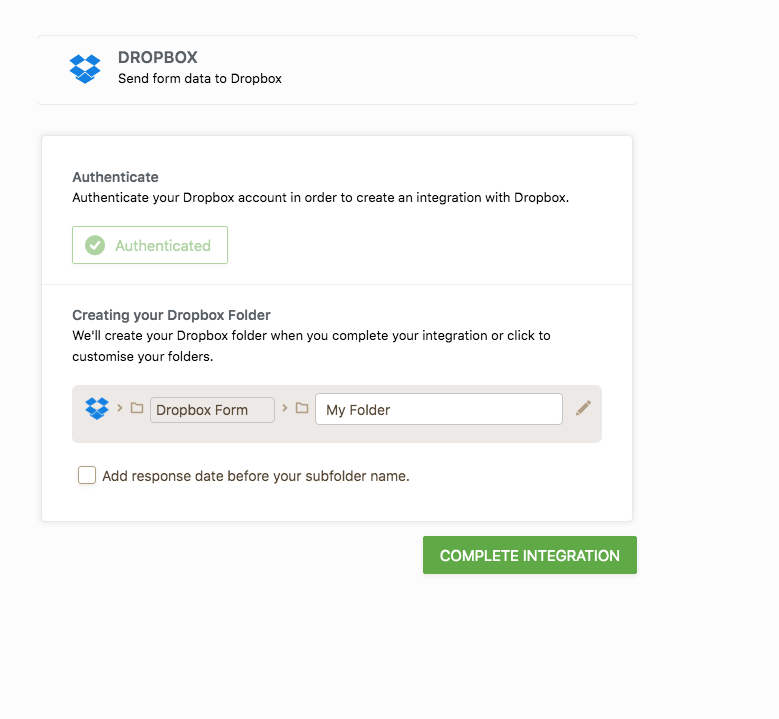 By adding "File Upload" field, you will allow someone to upload their files to your Dropbox. Additionally, you can add other form fields that you want to collect information from someone. 1. Click on the SETTINGS at the top menu. 2. 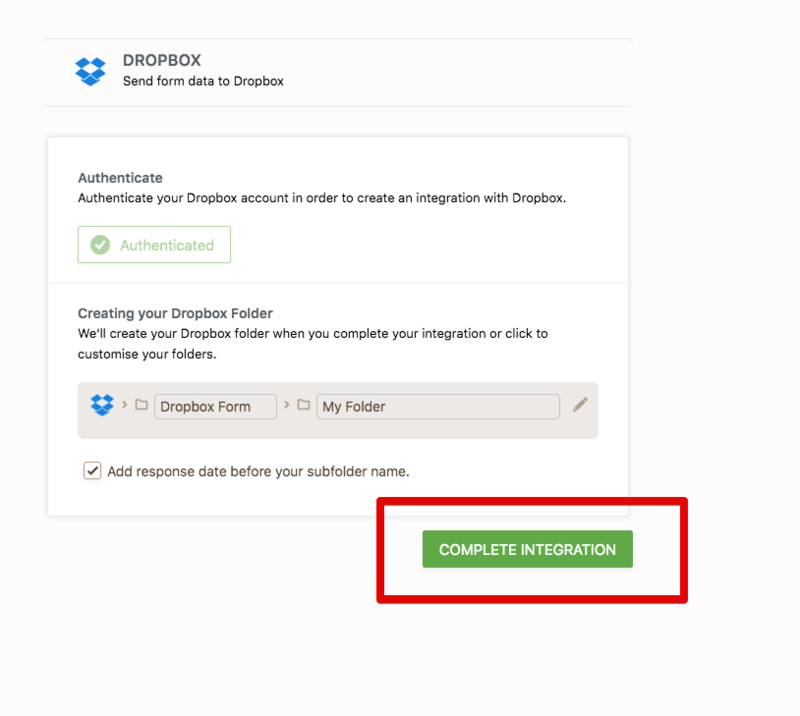 Select INTEGRATIONS, then select DROPBOX. 3. Click on the AUTHENTICATE button. 4. 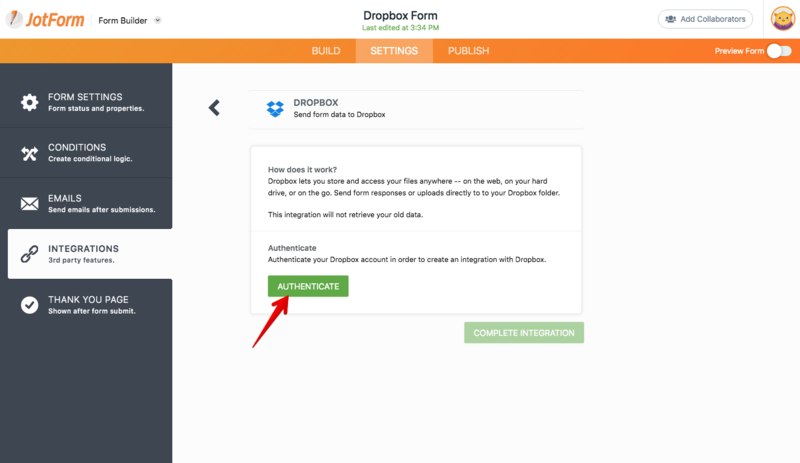 Login to your Dropbox Account, then click on the ALLOW button. If you prefer the field-based folder names, you can click on the Pencil icon and select the field, then click on the APPLY button in order to save. You can also add the submission date before the submission folder name by selecting the "Add response date before your subfolder name" option. Additionally, you can define custom folder names by clicking on the box next to the main dropbox folder. 6. Now, click on the COMPLETE INTEGRATION button. 7. The integration is ready now! Just click on the FINISH button. 1. 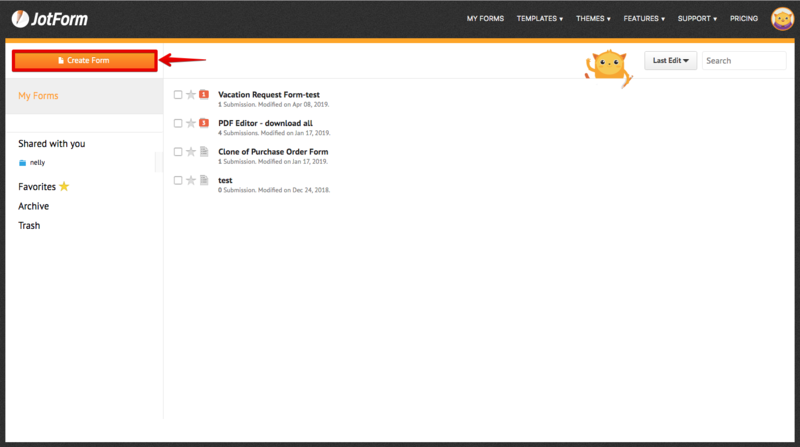 Open your form and click on PUBLISH at the top menu. 2. 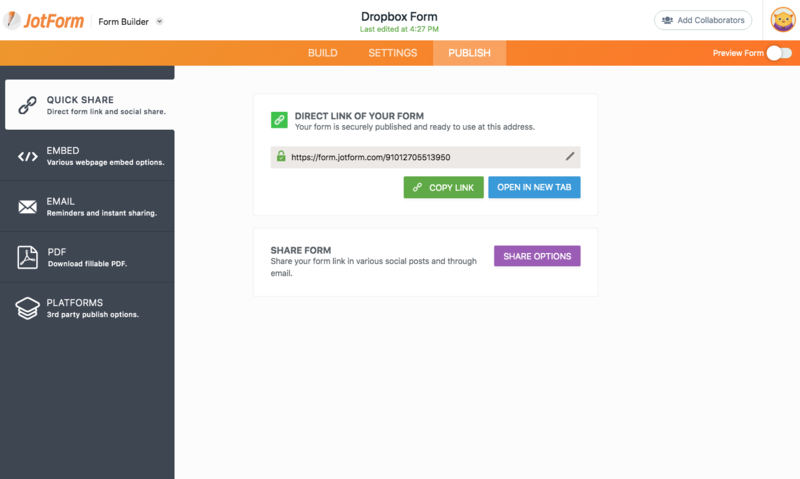 If you select QUICK SHARE, you can copy the form link and send it to someone. Additionally, you can share your form via email. Just go to EMAIL> SHARE ON EMAIL and customize the From Name, To, Reply To, Email Subject and Body of the message. The integration is done! 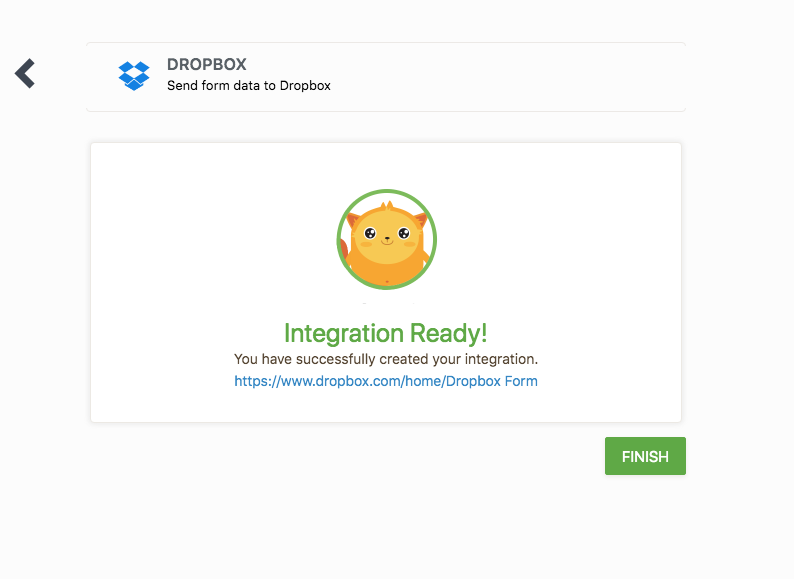 Now you can get uploaded files directly into your Dropbox account from now on. If you need any assistance, please let us know via Support Forum. 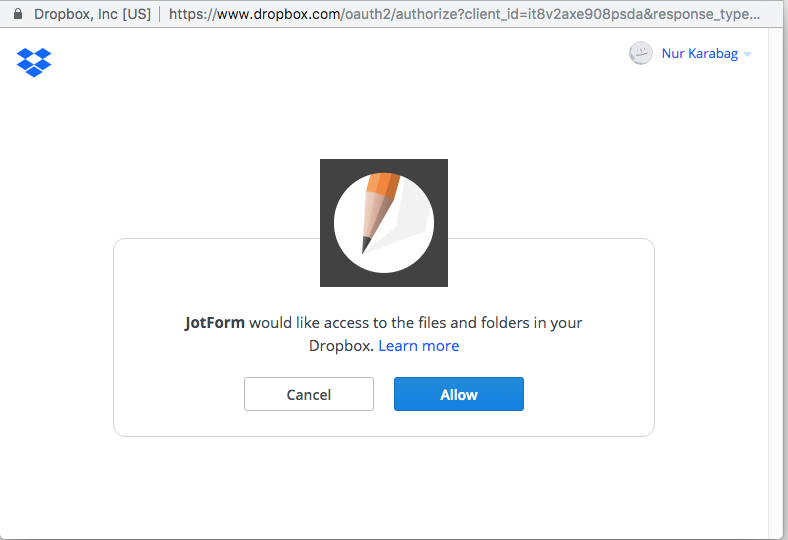 What's New in JotForm 3.0? How to integrate CardConnect with your forms? 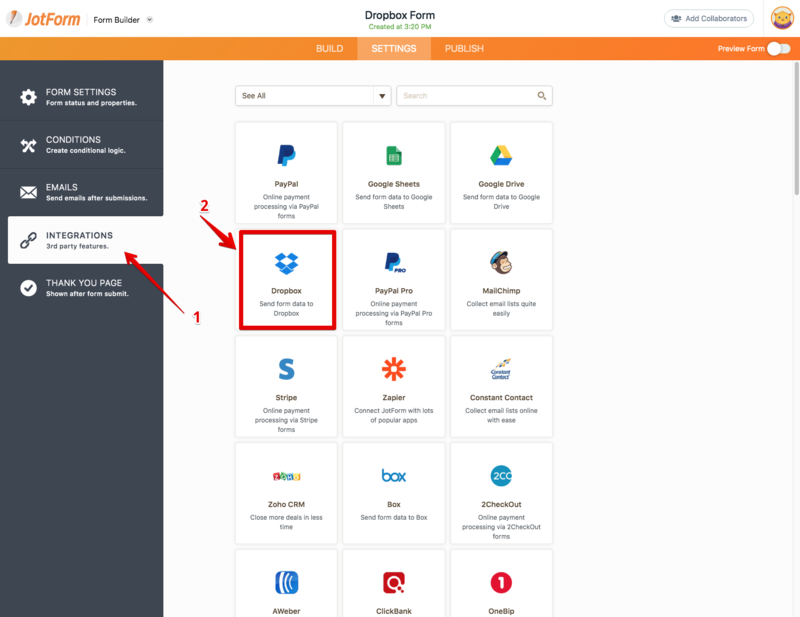 How to integrate Paymentwall with your form? How to integrate Skrill with your form? How can I make the hint text bigger and BLACK on my form?